Smith & Wesson’s new version of the incredibly popular M&P Shield pistol offers three improvements on the existing model. The obvious feature is the barrel porting, which is intended to reduce recoil, particularly muzzle jump. Additionally, the model is built in the Performance Center and features fiber-optic sights and a lighter, crisper trigger pull with short reset. There are a few potential drawbacks, too. Porting the barrel causes burning gases to be directed upward when the pistol is fired, reducing recoil but potentially creating a bright upward-angled flash that, when shooting in low light, could temporarily blind the shooter. On a lesser scale, muzzle porting makes the report of any gun somewhat louder, and the lightening cuts and barrel porting make the piece more susceptible to collecting lint and other crud. What’s the difference in damage to the family finances? Surprisingly, only $70. The standard model’s suggested retail is $449, the Performance Center version is $519. I’ve been carrying a standard Smith & Wesson M&P Shield as my primary concealed carry gun ever since I had the opportunity to attend the company’s Smith & Wesson’s new version of the incredibly popular M&P Shield pistol offers three improvements on the existing model. The obvious feature is the barrel porting, which is intended to reduce recoil, particularly muzzle jump. Additionally, the model is built in the Performance Center and features fiber-optic sights and a lighter, crisper trigger pull with short reset. I’ve been carrying a standard Smith & Wesson M&P Shield as my primary concealed carry gun ever since I had the opportunity to attend the company’s pre-launch seminar at the factory in Massachusetts. While there, I put almost 1,000 rounds downrange through my issued test pistol with only one malfunction, and that was caused by a visibly defective cartridge. In addition to the impressive reliability, I found the light, slim pistol shockingly accurate. After an inside look at the rigorous demands that Smith & Wesson puts on any firearm that achieves the “Military & Police” designation, I came to the conclusion there is no finer hard-using concealed-carry handgun, an opinion I still hold today. Point is, I’ve got years of practical, everyday experience with the M&P Shield, and the chance to review both 9mm and .40 versions of the new Performance Center model—contrasting feel, shootability and performance between the two and comparing it with the standard model—was a welcome one. The Shield itself is a polymer-framed pistol designed expressly for concealed carry, a slender gun—less than an inch wide at its widest point—weighing in at about 18 ounces. A hybrid magazine is mostly single stack in its design, and two are included with each gun: a flush fit and an extended version. Von Benedikt likes the visibility provided by fiber-optic sights but is suspicious of them on carry guns. Those on the Ported Shields calmed his fears due to the robust frame protecting the rods. In 9mm Luger, the flush-fit magazine contains seven rounds, the extended magazine eight. With one up the pipe, the little pistol holds either eight or nine cartridges total, depending on which magazine you choose to carry. In .40 S&W, capacity is one cartridge less, so six in the flush-fit mag and seven in the extended version. Both the slide and barrel are constructed of stainless steel and finished in Smith & Wesson’s über-hard (68 HRc), corrosion-resistant black coating. The barrel is 3.1 inches long, and in the case of the ported version it has an oval port measuring 0.175 by 0.08 inch at about 10 o’clock and two o’clock 0.66 inch south of the muzzle. Three weight-reducing cuts grace the top corner radiuses on each side of the slide just behind the front sight, and the front cut serves double duty to vent the gas escaping from the barrel port. While there’s nothing wrong with the three-painted-white-dot sights on the standard Shield, they don’t perform well in low light, and many shooters end up replacing them with night sights or fiber-optic versions—or purchase a night-sighted version to begin with. While I’m a fan of fiber-optic sights for fast work where increased visibility is an advantage, it has to be the right set of fiber-optic sights. All too many are not robust enough to take the abuse caused by extensive shooting, and rare indeed are the fiber-optic sights that can take years of everyday carry inside a trouser waistband. My impression is that the sights on the Performance Center Shield will go the distance. The fiber-optic rod is supported and protected at the midpoint and down the top by steel ribs, and it should last. The fire controls on the new Shield feature two significant changes over the standard version: a thumb safety—which some will want and some won’t—and an excellent Performance Center trigger. Scalloped slide serrations at the rear of the slide offer a non-slip surface that makes for positive functioning with sweaty, shaking or bloody hands yet isn’t abrasive on clothing. At the top left side of the grip sits a small, unobtrusive thumb safety, offering additional security to the hinged trigger shoe. Said trigger shoe functions much like the Safe Action trigger on a Glock, preventing the firearm from being fired unless the trigger is pressed rearward. When the M&P Shield was first introduced, some shooters decried the additional thumb safety, claiming it’s not necessary and could cause life-threatening delay if a shooter not used to a thumb safety on his or her primary duty gun forgot to disengage it in a fight. Eventually, Smith & Wesson added a variation of the Shield without a thumb safety. However, the fact that it’s present on the Performance Center version suggests more pistols are sold with a thumb safety than otherwise. As for the trigger pull itself, it also has received an upgrade in the Performance Center. While the trigger on the standard M&P Shield is rated at 6.5 pounds—and measures exactly that on my 9mm—the triggers on the test Performance Center models weigh significantly less: five pounds, three ounces in the case of the 9mm, and five pounds, eight ounces on the .40 S&W version. Additionally, the trigger pulls on both ported models are a bit crisper than on my standard model. Frame-oriented features that the Performance Center ported version share with the standard model are the 18-degree grip angle, which research engineers determined to be the optimum angle for the average human hand, and a high undercut at the top rear area of the frame that positions the hand close to the axis of the bore and enhances recoil control. The mainspring assembly powering the slide is a dual-spring affair, the outer spring being a flat-wire version. Compact pistols work springs hard, and this system shrugs off the punishment and keeps on functioning. The ported Shield 9mm exhibited a touch less recoil than the standard version with some loads; it’s likely the difference would be felt more with the .40. Let’s move on to practical performance, comparing the 9mm to the .40 S&W version and both ported versions to the standard model. Bad weather meant I had to test the pistols at Rangemasters of Utah indoor range, and here I’ve got to insert a disclaimer. While the two handguns turned in acceptable accuracy, I discovered that in the artificial indoor lighting my middle-aged eyes struggled to resolve the sights. Just like with a camera lens, the wider you open the aperture of your lens (in this case the pupil of your eyes), the shallower your focal depth of field becomes. I’m satisfied with the results of my accuracy tests, but have little doubt that had I performed them in bright, outdoor conditions they would have been even better. At first blush, the ported guns made two distinct impressions. The sights are indeed quite a lot more visible than the three-dot version on the standard model, especially in low-light conditions, and the trigger is, as expected, significantly better. In fact, the improvement in the trigger was the single greatest difference in my opinion. It alone is worth the extra $70. I began with the 9mm, shooting Winchester’s 115-grain white-box full-metal-jacket target load, and was pleased to find minimal flash from the porting. Next I tested the Black Hills 115-grain JHP load, which isn’t rated a +P load but produced the highest velocity of all the loads tested. Accuracy was excellent and velocity impressive—and so was the flash from the barrel ports. Flame jetted like a high-end firework, clearly visible even under the LED lighting. Of the five 9mm loads I tested, three produced visible, consistent flash driven upward through the barrel porting. When I really focused on it, I could occasionally pick up a trace of flash from the other two loads, but it was far less dramatic. I quickly came to the conclusion that were I to carry a ported M&P Shield as my everyday sidearm, I’d test self-defense loads for both accuracy and low flash. Accuracy results are the averages of three five-shot groups fired at 15 yards from a sandbag rest. Velocity is the average of five rounds measured 10 feet from the muzzle with a Shooting Chrony chronograph. Abbreviations: FMJ, full metal jacket; JHP, jacketed hollowpoint. Statistically, most deadly threats occur in the dark, and I wouldn’t want to be blinded by the tool that was supposed to save my life. Most top-drawer ammunition manufacturers are currently making ammo engineered for use in short-barreled sidearms, touting maximized velocities and minimized flash out of the abbreviated tubes. I’d want to focus on such loads when choosing my carry and home defense ammo. Predictably, the .40 caliber Ported M&P Shield recoiled noticeably harder than the 9mm version. Still, it wasn’t uncomfortable to shoot. With the very ergonomic grip design and just enough weight in the gun, it was controllable. With accuracy testing complete, I put up fresh target faces at seven yards and began rapid-fire testing. Fast double-taps were possible with both calibers, but when I began dumping magazines into the target I found—no surprise—that times were faster and accuracy slightly better with the 9mm version. The 9mm vs. .40 S&W controllability/capacity debate is one that has fueled many a gunshop argument, but we’re not here to solve that. Suffice it to say that in the Ported M&P Shield, the 9mm hits faster and the .40 S&W hits harder. Take your pick. Setting the .40 caliber version aside, I shot my standard M&P Shield 9mm against the new ported version with identical ammunition and began comparing practical performance. Immediately, the improvement in the trigger and the better sights on the Performance Center pistol stood out. The pistols come with one extended and one flush-fit magazine, and the capacity difference between the 9mm and the .40 is one round. Feeding was flawless in all instances. Reduced recoil was not so apparent. I fired both pistols two-handed and one-handed using both strong-side and weak-side hands, dumped magazines, ran double-taps, fired slow-fire, and compared feel and accuracy throughout. Frankly, I felt little difference in recoil. 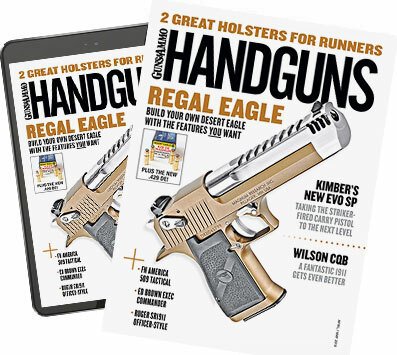 With the heavier loads, such as the Black Hills 115-grain jacketed hollowpoint that produced such impressive velocity in the ported pistol, it was discernible—but just so. With lighter loads I honestly couldn’t tell much difference. I didn’t have a standard .40 caliber version on hand to compare, but conceivably the porting offers an increased advantage there. To my delight—but not surprise—both pistols chugged through all ammunition types and all testing without a single hiccup. But then, I’ve never heard of an M&P Shield that was unreliable. Prior to my pistol test, the editor passed along a letter from a reader wanting to know about the effect of the barrel ports—specifically the heat, gases and fouling produced by them—on the fiber-optic front sight. As the round count accumulated I kept an eye on it, and, sure enough, fouling slowly accumulated, and brightness dimmed. I don’t think the ports direct significant heat at the fiber, even during full magazine dumps, so distortion shouldn’t be an issue. However, to maintain optimal performance shooters will want to wipe down the fiber-optic rod occasionally. One other minor issue with the porting and fiber-optic sights concerns maintenance. When carried day after day inside one’s pants, dust, lint and other crud is likely to accumulate in the slide and barrel ports and around the fiber, particularly if carried in an open-type holster such as the Versa-Carry I prefer for my standard M&P Shield. If neglected, such crud could conceivably cause a malfunction or reduced sight clarity, so while you should periodically clean any carry gun, the ports and fiber optic on this Shield model make the practice a little more important. In the final analysis, is the new Performance Center Ported M&P Shield worth the extra $70 required to step up from the standard version? Absolutely. I don’t think there’s another pistol of its type that’s as comfortable to shoot and carry, or as reliable, whether in its price category or higher. As I mentioned, the improved trigger alone is worth the price, plus you get better sights and a bit better recoil control. And finally, the pure cool factor of the “Performance Center” rollmark. The one drawback worth being aware of is the potential for the porting to cause a bright flash that can impair your low-light vision. To overcome that, choose ammunition loaded with low-flash powder geared for optimum performance in short-barreled handguns.